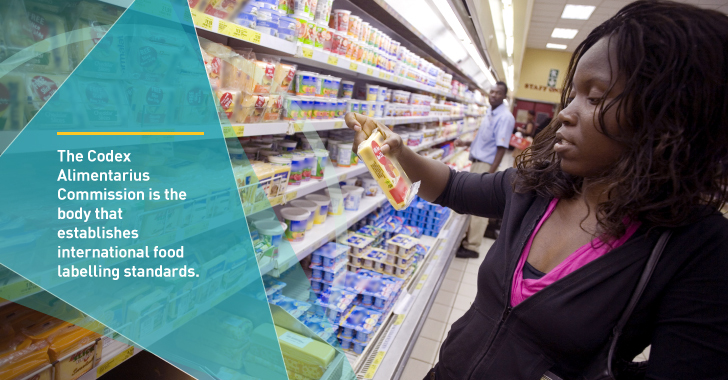 FAO promotes Food Labelling as an effective tool to protect consumer health in terms of food safety and nutrition. Food labels convey information about the product’s identity and contents, and on how to handle, prepare and consume it safely. With the increase in global trade and a shift away from the traditional face-to-face food producer and buyer relationship, there is a greater need to create food labels that are clear and can be trusted. A food label, the information presented on food product, is one of the most important and direct means of communicating information to the consumer. The internationally accepted definition of a food label is any tag, brand, mark, pictorial or other descriptive matter, written, printed, stencilled, marked, embossed or impressed on, or attached to, a container of food or food product. This information, which includes items such as ingredients, quality and nutritional value, can accompany the food or be displayed near the food to promote its sale. In 2014 at the Second International Conference on Nutrition (ICN2), governments affirmed that “empowerment of consumers is necessary through improved and evidence-based health and nutrition information and education to make informed choices regarding consumption of food products for healthy dietary practices”. FAO works in partnership with WHO to advise the Codex Alimentarius Commission on technical and policy matters related to food labelling. The Codex Committee on Food Labelling (CCFL) is the Codex subsidiary body responsible for setting standards and guidelines on labelling that is applicable to all foods and the Codex General Standard for Labelling of Prepackaged Foods (CXS 1-1985) is the key Codex instrument for delivering information about food to the consumer. The Codex standard is used by countries as guidance for harmonization and has also been used as the basis for new food labelling policies. One of the main drivers for nutrition labelling is the increased prevalence of diet-related non-communicable diseases. These labels can be effective instruments in helping consumers to make healthful food choices. To maximise the potential of nutrition labels and health claims to improve public health, awareness campaigns and education programmes should be provided on an ongoing basis to help consumers to understand and use labels appropriately. The Codex Alimentarius guidelines recommend the following types of nutrition labelling: Nutrient Declaration, Nutrient Reference Values, Quantitative declaration on ingredients (QUID), Nutrition Claims and Health Claims. Food manufacturers use date marking to advise subsequent food chain operators on the appropriate shelf-life of a food. The Codex Alimentarius provides guidance on two key date marks “Best before date” or “Best quality before date” and ”Use-by-Date” or “Expiration date”. Date marking on labels is also linked to food waste. A study carried out by the European Commission estimated that approximately 10% of food waste in the EU is linked to date marking. Food waste can be the result of misinterpretation by the consumer, or it can be due to the way date marks are utilised by food business operators and regulatory authorities. Educating all supply chain stakeholders on the difference between "best before" and "use by" dates can help to prevent and reduce food waste. In response to high levels of food waste, many countries have established food recovery and redistribution (R&R) systems. Some of the R&R operations rely heavily on date marks on labels, as they “recover” food items that are past the “best before” date. In countries where the food legislation allows, such foods can be “redistributed” for human consumption because there are no safety implications even if consumed after that date. 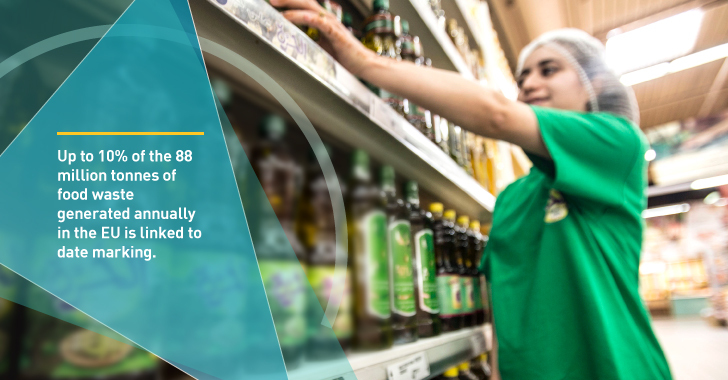 One of the main aims of a labelling policy is to prevent food sellers from deliberately misleading consumers through false representations on a package. FAO is following this situation carefully and is engaged in a number of activities to contribute to the preparedness of countries to prevent food fraud or to mitigate its impacts. FAO is particularly concerned with the provision of information and analyses that inform policies and programmes across sectors and in raising awareness in developing countries on the issue and its relevance to them. Recently, FAO commissioned a review of fraud in the fisheries sector, which is one of the most vulnerable sectors to food fraud, providing recommendations for future actions. 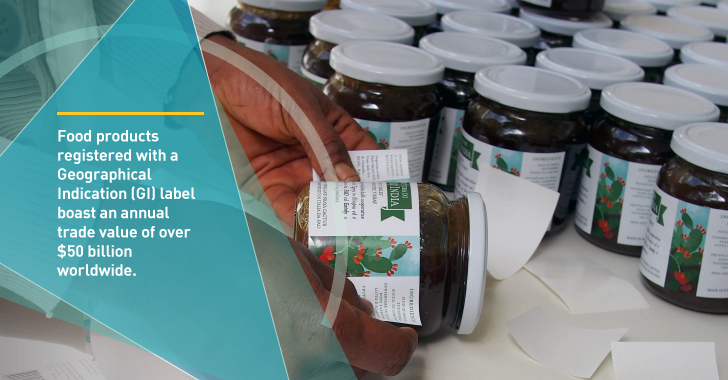 FAO recognizes the importance of supporting countries, including government authorities, food producers and consumers, to understand the dynamic role of food labelling in the global food system. Along with the International Trade Centre (ITC), FAO is working with sub-Saharan countries to strengthen their national food supply chain, focusing on small and medium agro-enterprises (SMAEs). This is being done through the implementation of regional projects that aim to provide support to food chain actors, governments and private-sector entities on appropriate food packaging and labelling systems. This involves the delivery of a training program to support SMAEs to improve the handling, packaging, processing and labelling of food products in a sustainable way. Geographical Indication (GI) labels, boasting an annual trade value of over$50 billion worldwide, are legal tools that link food products to their place of origin, providing both economic, social and environmental value to rural regions. These labels are given to products with specific attributes, qualities or reputation stemming from their geographical origin. Through the preservation of food culture and the promotion of healthy diets, linking food products to their origin through labels supports the achievement of the Sustainable Development Goals.